Dorian (Dori) Harmon Makenzie Gray was born on June 9, 2000 in Cincinnati, Ohio. She is the loving daughter of Derrick Gray and Chandra (Terrance) Denham. Dori loved the Lord and had accepted Christ as her personal savior at an early age. Dori loved to sing all the time and as a child especially a song called “I’m not Worried about my Soul.” Dori had a very special bond with her grandparents, she loved going to their homes to spend time and told them of all the extracurricular activities she was involved in knowing they would be there to support her. Dori enjoyed helping others and had a heart to serve, she would go above and beyond to help others and offered so much grace to people no matter their circumstances. Dori was a pillar of strength, she would give her last to anyone. Dori was a people person always making you laugh and was loved by so many. Dori also had a special relationship with her nieces and nephews. They really looked up to her and loved spending time with her. They were her world and they knew it. Dori was involved in many extracurricular activities. 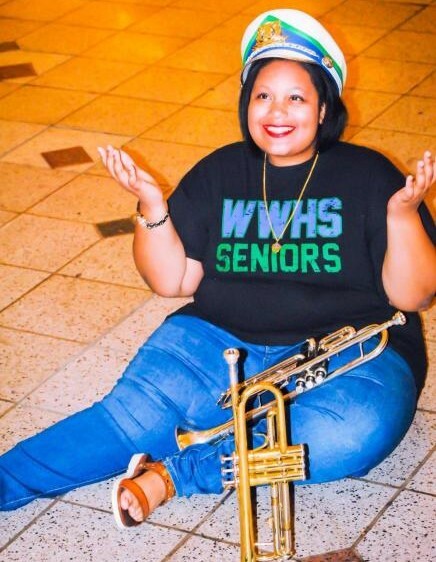 She was a member of the Winton Woods Band where she played the trumpet (boy could she play), and was also a member of the Winton Woods Bella Voce, this girl had a true ear for music. Dori had the privilege at an early age to travel the world, she has been to Africa and China. One of her favorite trips was her time in Africa, Dori had the chance to serve underprivileged families and even brought items from the U.S to help those in need. Dori also received many awards and accolades throughout her young life that adds to the type of heart and compassion she portrayed. Dori recently started her freshmen year at Sinclair Community College where she was studying Criminal Justice. Her dream was to be employed as a police officer to help bring about change in our current law enforcement and equal rights. Dorian wanted to see equality, respect, and justice for all people. Dori gained her heavenly wings on September 8, 2018 and was proceeded in death by great-grandparents, 1 grandparent, 1 aunt, and 1 sister. She leaves to cherish her memory Grandparents; Geraldine (Ron) Brown, Shirley (Roger) Williams; Parents: Derrick Gray and Chandra (Terrance) Denham; Siblings: Charmaine Johnson Nealy; Nieces: Genesis Johnson and Gabrielle Johnson; Nephews: Gavin Johnson and Giovanni Johnson; a host of devoted aunts, uncles, cousins, and other loving relatives and friends.